You are here: Home / HOME SAFETY / Real Estate Safety- Updated! Learn how to trust your gut feelings in this interactive class. 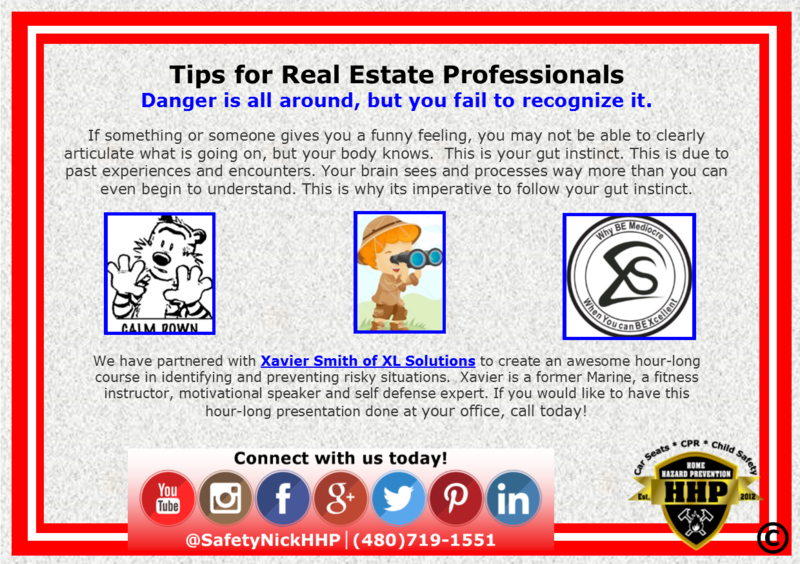 You have all heard about the need for extra safety, as a Real Estate Professional. But the need cannot be overstated in my opinion. Every year, hundreds of Real Estate Professionals are injured by ‘clients’ during the course of their work. 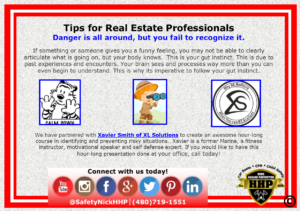 Real Estate Safety Tips – Updated! You already know most, if not all, of the basics. Some of the most basic are listed below for your reference. • View the property before the clients gets there- and learn the outs! • And never wear flashy or show expensive tastes or jewelry. But what we really want to talk about is something that you use every day, but may not ever pay attention to. This is your gut instinct. If something or someone gives you a funny feeling, you may not be able to clearly articulate what is going on, but your body knows. This is due to past experiences and encounters. Your brain sees and processes way more than you can even begin to understand. This is why its imperative to follow your gut instinct. Because your brain knows that something is not right well before your consciously able to figure it out and communicate it. Home Hazard Prevention puts on an hour-long course about this process, and how to prevent dangerous situations from occurring, and what to do if the unthinkable does happen. For this awesome course, we have partnered with Xavier Smith of XL Solutions. Xavier is a former Marine, a fitness instructor, motivational speaker and self defense expert. If you would like to have this hour-long presentation done at your office, please call us today at (480) 719-1551.